Milwaukee Brewers tickets are very popular with baseball fans. Over the course of the history of this franchise it has seen many great ball players. These players include Robin Yount, Paul Molitor and Prince Fielder. This year's team has many great players on it. Will they get to the playoffs? There is no need to wait in line at the ticket box office to attend this event when you can get the best seats available in the house with GoodyTickets. We have made it easy for you to find the best seats with a very easy to use and interactive seating chart. This way you know where you will be sitting at while making memories watching this great event. The easiest and best way to find the greatest seats to this exciting event in a city near you is with our detailed interactive event calendar shown above. Find out when and where the events will be at and on the date or dates that works best for you. 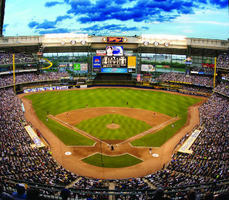 Milwaukee Brewers tickets are easy to get when you buy them from GoodyTickets. With you in mind, we have made it very easy to find the best seats and the best date or dates that work the best for you. The scheduled dates for Milwaukee Brewers tickets available can be located in our event chart shown above. The events are displayed according to date, venue, and/or location. If you do not find what you are looking for while shopping for tickets to see Milwaukee Brewers, call 913-231-2674 to speak with a GoodyTickets customer service representative. Once you have found the event you would like to atttend, click the “Tickets” link to continue to the next screen, which will highlight all listings for the event along with an interactive seating map. Schedules for Milwaukee Brewers events can be sorted as needed by price, e-tickets, quantity, section, or row. Proceed to checkout by pressing the “Buy” button related to the Milwaukee Brewers tickets that fit your needs. Once the payment has been received you will be contacted for confirmation of the transaction of your selected Milwaukee Brewers tickets. All Milwaukee Brewers tickets are backed with a GoodyTickets 100 percent ticket guarantee. Have peace of mind when you make your puchase for this event. You will receive 100% refund if Milwaukee Brewers event is cancelled and not rescheduled. You will also receive a 100% refund if your order was accepted but the tickets were not delivered by the seller or shipped in time for the event. GoodyTickets also provides a worry free guarantee that your tickets will be valid upon entry. If they are not valid we will provide you with a refund.